The Class 305s were 4-car, slam door electric multiple units (EMUs). The Class 305s were built by British Railways at Doncaster in 1960 and used for 30 years on commuter routes into London's Liverpool Street and Fenchurch Street stations, before being replaced by more modern stock. Following electrification of the East Coast Main Line and the Drem to North Berwick branch in July 1991, five units were transferred to Scotland and maintained at Shields Depot) for use on the Edinburgh to North Berwick route. From July 2001, some duties were taken over by Class 318 units, and by DMUs. 305502 and 508 were withdrawn and taken south to Immingham for scrap (together with 303014) by 60088 on 7th November 2001. The final 3 units (501, 517 and 519) were moved from Edinburgh Waverley to Immingham by 66098 on 31st January 2002. 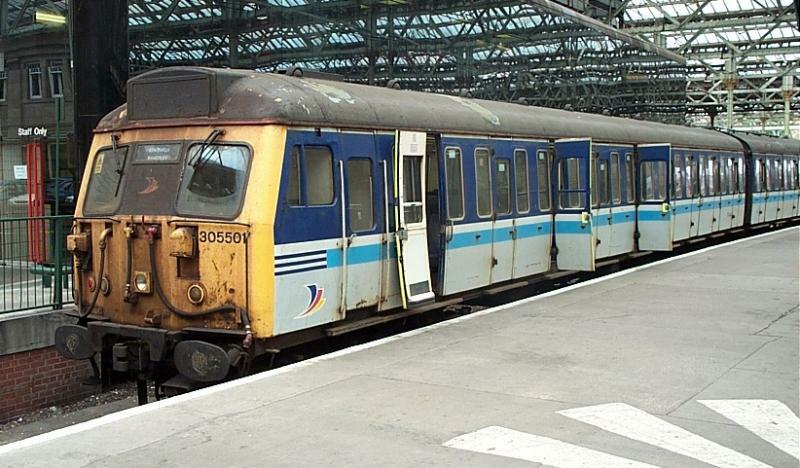 Class 322 units were first introduced onto the North Berwick line shortly after the Class 305's demise. Created by e37405 and last modified by brucekitchener at 11:53, 01 of July 2007.